The beginning of Sperlonga dates back to the old Greek legends. She was a gorgeous nymph, patroness of the dropped limestone. Zeus fell in love with her and, the only way to get her was to turn himself into someone or something else. At night Zeus flew down on earth shaped like a burning meteorite and, landed just among Sperlonga's thighs that was ingenuously sleeping on the beach. The terrifyng embrace upsets the litoral and lift up the earth into rough and glittering crags, which became nowaday the aim of many climbers. from Terracina take the via Flacca towards Gaeta then. 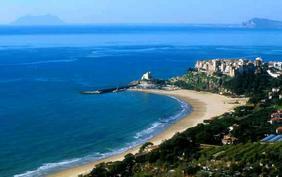 beyond Sperlonga the road twists and turns, it become a panoramic drive and you'll enjoy a beautiful top view of the see. You'll drive through a succession of road tunnels and, at the end of the last one (the Fourth) you could see the crags up on the left and you can park the car by the renowned "Guido il Mozzarellaro" approximately 500 meters ahead. Beyond the fourth tunnel the first thing yuo'll see is a long, long beach, called Piana di S.Agostino and, most of the crags faces to it. The "Paretone del Chiromante" is the core of Sperlonga, an enormous wall of limestone of good quality and exclusively introduces streets of plate. It is' easily reachable from any path. It offers some beautiful and easy routes and multi-pitch routes, as the "Spigolo di Ferrante". The second projection is constituted by the Mount Moneta, imposing structure that immediately attracts the eye of the climber. This beautiful structure however it is typically frequented in wintertime, because located more internally, less ventilated and it takes about 20-30 minutes to be reached. The most interesting sector is the "Avancorpo di Destra", that, accordingly it is the more frequented, also for the easy access. Smaller and less evident, but not for this less beautiful, it is the Crag of the Pueblo with the possibility to climb in the rainy days. Very amusing results the sector "Boca de Cielo" constituted by a beautiful plate, able to thrill everybody. Out of the Piana di S. Agostino along the Via Flacca between Sperlonga and Gaeta you'll find the beautiful Crag "La Spiaggia del Aeronauta". The Crag is divided in two sectors: l'Approdo dei Proci e la Grotta dell' Aeronauta. The first one offers some overhangs and beautiful technical plates, able to engage and to amuse the beginners, while the second is the undisputed kingdom of the strong arms climbers. Biblio: You ca purchase the book "Arrampicare nel sole",with the description of over 700 routes at "Guido il Mozzarellaro"
Logistic: A lot of campings are located all along the coast nearby the crags..